A recent paper, Redefine Statistical Significance by 72 (😱) co-authors, has caused quite a stir in the statistical community. Our student-run journal club at Vanderbilt will be discussing this contribution at our meeting led by Nathan James this week, so I’ve attempted to create a list of significant responses/commentary that have come out since this paper was posted on PsyArXiv. This was compiled mostly via a quick Twitter search - please let me know what we are missing! Justify Your Alpha: A Response to “Redefine Statistical Significance”: Response posted to PsyArXiv by 88 (😱😱) researchers suggesting that researchers ought to select and justify P-value thresholds prior to collecting any data. Should we lower the p-value for statistical significance from 0.05 to 0.005 ? Abandon Statistical Significance: Response suggesting abandoning the null hypothesis significance testing paradigm entirely. 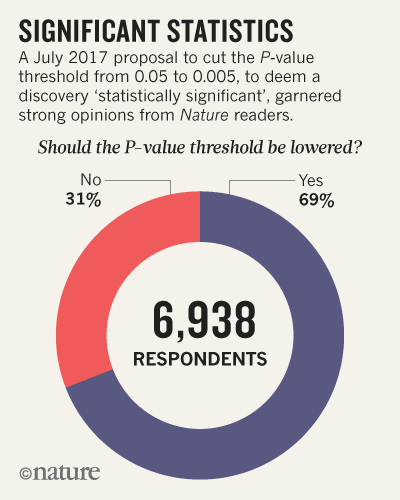 Changing the default p-value threshold for statistical significance ought not be done, and is the least of our problems. : Medium post by psychologist Timothy Bates where he calls the proposal “a risky distraction” from the root causes of irreproducible results. The Effort Report, episode 55: The most recent episode of The Effort Report (a podcast by Elizabeth Matsui and Roger Peng) discusses this topic. Please comment/let me know if we have missed anything!